Raphaella Smits plays “Viennese Classic”, the interweaving of the Italian bel canto and the German romantic. In the first half of the 19th century Vienna was the musical centre of the world, and certainly a centre for the guitar as well. The “Viennese Classic” is the interweaving of the Italian bel canto and the German romantic. 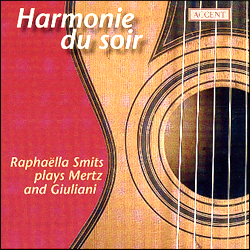 Read also Pieter Andriessen's interesting comparison of 'Harmonie du soir' with 'The Romantic Guitar', Raphaella's first Mertz-Giuliani album of 1988. Many guitarists and composers of the 19th century used instruments with an extended compass. Thus Legnani and Regondi played on guitars with 8 strings, Coste with 7 and Makaroff with 10 strings. Mertz went from a 6-stringed guitar to one with 8 strings and ended up playing one with 10 strings. The sounds which the Roudhloff guitar offers to the Haydnesque Giuliani Sonata or the more aggressive Tarantella of Mertz, with the typically compact bass sound and great contrasts, are difficult to achieve on the Mirecourt instrument of about 1827. On the other hand the Mirecourt responds very well to the precise playing needed for the fast virtuoso cadenzas of Mertz or the operatic evocations of Giuliani. Likewise the seventh string presents possibilities from which the music can benefit. Both instruments are good teachers. 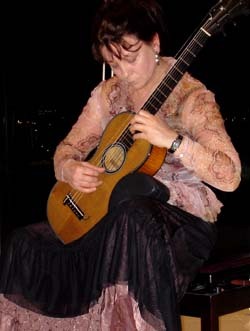 Len Verrett from <EarlyRomanticGuitar.com> wrote: "This recording is a must-have of the period guitar ; all period instruments, superb playing, and ground-breaking repertoire of quality. Raphaella Smits' playing is hypnotic, virtuosic and captivating." and also: "The last Mertz selection is the Tarantelle from Bardenklange, and although recorded by Reid, Holzman and others, the recording here is definitive." "Smits interpretes this repertoire with perfect balance between the brilliance and sensitivity. She unravels the sense of these fantasies and obtains a related and very eloquent discourse. The result is a delight that is redoubled with the benefit of the differentiated loudness and precious sound of the two guitars used."